Álvaro enjoying winter on Pierce. Introduction: Born in Portugal, Álvaro, at age 28, started to dedicate more of his time to the outdoors. Since then he has not only explored his own country but has traveled to others looking for new challenges. While living in Spain, he had the opportunity to discover the joy of being above tree line — his favorite landscape. The mountains in Romania and French Alps are still among his best memories. The opportunity to travel west to the United States opened the doors to new horizons. Living currently in Hudson, Massachusetts, he has put many miles in his car to hike all over New England. 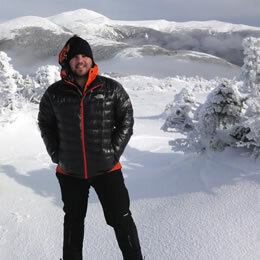 He is also an avid advocate for Portuguese food, and likes to bring it to the mountains. Résumé: Walked The Camino de Santiago in 2004, the Portuguese route to Santigo de Compostela in Spain. Backpacked in Retezat National Park in Romania. Climbed Aiguille du Tour in the French Alps. Had two successful climbs in the Spanish Pyrinees. Climbed Almanzor in Gredos, the highest peak in central Spain. While living in Europe took on many other mountains in Spain and Portugal, and now he is working on the New England’s 67 4000-footers (59 so far). Álvaro also guided a 9-day trip in 2016 to two mountain ranges in Portugal (Estrela and Gardunha), which also included exploring historical sites and local gastronomy. Q: Tell us what’s in your heart when you think about the Whites. A: There are many places in the world that are idyllic. These places fill our souls in such a way that it is difficult not to return to them over and over again. There is an undeniable beauty that shapes the White Mountains — seasons change, bringing something new each time. The harsh weather makes it a year ’round challenge for the adventurous spirit. In college I had the opportunity to study the literary Romantic period, giving me the chance to discover American authors that promoted environmentalism, conservation and preservation. For me there was one point in common: a belief that a connection with nature is mentally and morally healthy. Hiking in the White Mountains reminds me of the literary works from the last two centuries, and provides the raw material I need for my own poetry. Q: Tell us your feelings about hiking and recreating outdoors. A: Being on a trail, whether in the woods or above tree line, not only makes us feel healthier, it connects us with our roots, and it is important to share that experience with others, recreate that life experience since nature is part of us. I feel like better person on the mountains. Q: If you can convey one thing to your clients, what will it be? Q: Give one bit of White Mountains hiking advice to the world. A: The White Mountains are definitely one of the best places to experience alpine adventures at lower altitude. The roughness of its trails makes sure one will take pride on the endeavor.